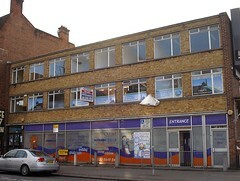 Premier House, the 1950s building at 89 London Road, is currently owned and occupied by Croydon Islamic Community Trust. 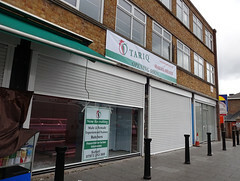 At the time of writing, the Trust uses the upper two floors while the ground floor is in preparation to open as a butchers shop, but the organisation’s long-term plans include use of the full building for the benefit of the Muslim community. Croydon Islamic Community Trust, 89 London Road, December 2015. Photo: author’s own. Until the late 1950s, this was the site of the original West Croydon Methodist Church. Built in 1900 but lasting a mere half-century, in 1957 the church was demolished and replaced with a smaller building set further back from the road. The space this left along the London Road frontage was filled with a new commercial building comprising shop premises on the ground floor and offices above. Although the initial proposals for the new building had included a division into four shops, the first occupant seems to have taken up the entire ground floor by itself. Ketts, a radio and television rental company which also sold white goods and vacuum cleaners, was in place by October 1959. Ketts was a family firm, founded as a bicycle sales and repair shop by “Pop” Prickett and three of his four sons at 1 Clifton Road, Spring Grove Corner, Isleworth, on 12 December 1946. The name, a truncated version of the family’s surname, was chosen to be “short, easily recalled and not easily mispronounced”. From the start, Ketts did not focus solely on the sale and repair of bicycles, but also offered bicycle and electrical accessories. As the supply of (and demand for) other electrical goods grew in the post-war years, the company began to sell items such as “radios, vacuum cleaners and the occasional washing machine”. Indeed, their second shop, opened at 281 Kensington High Street in 1949, stocked only electrical goods, and the shop frontage described the company as “Television and Radio Engineers” with no mention of bicycles. Ketts, Sutton High Street. Photo © Brian Gittings, used by permission. This branch opened in 1970 and closed in 1989. By the time it opened on London Road, the company already had several other branches in places including Eastcote, Hounslow, Kensington, Kingston, Richmond, and Wimbledon. It was also rapidly expanding, with a total of 24 branches opened between 1959 and 1961. The newness of the London Road building did mean that it “needed shop fronts and fitting-out but this gave [the company] the opportunity of presenting the Ketts logo and the unique shop front design”. As a renter and retailer of bulky goods, Ketts likely made full use of this large space. By February 1960 it was advertising examples of the “latest products of Electrical Division of RADIATION Limited in our showrooms now”, all for sale either outright or via an initial deposit followed by weekly payments. One of these was the Thor “automagic spin-dry washing machine”, which “Washes, rinses, spin-dries in ONE giant tub by foot-pedal control”, and could be had for £81.13s.10d (£1,697 in 2015 prices) upfront or a deposit of £4.13s.10d followed by 17s.10d/week for 104 weeks (£97.45 and £18.52 in 2015 prices). Another was the Parnall “‘tenten’ suction cleaner with exclusive ‘vibra-beater’”, which “suction cleans and sweeps without harming carpet”, for £28.10s upfront (£592 in 2015 prices) or a deposit of £1.10s followed by 6s.3d/week for 104 weeks (£31.16 and £6.49 in 2015 prices). I remember buying a couple of vinyl LP’s from a carousel rack outside the shop [...] in the early 1970’s. It wasn’t a record shop as such but must have sold a variety of things. [...] the most recent of the LP’s I bought there was issued in 1970. It was probably in the rack outside as a clearout item a year or so later as I bought it at a reduced price. Front and back of a Ketts record bag. From the personal collection of Leon Parker of the British Record Shop Archive; images © Leon Parker, used by permission. Ketts’ Whitgift Centre branch was to remain until 1988. However, after spending around two decades on London Road, it departed West Croydon for good in 1978. To assist the development of a widespread understanding of the value and importance of profitable industry and commerce within the United Kingdom’s mixed economy. To fight subversion and to keep members informed of the activities of those who are hostile to productive enterprise in industry and commerce. Reading between the lines of this gives a clue as to why a 1989 publication by the National Council for Civil Liberties (Liberty) described the Economic League as “one of the more notorious private employment vetting agencies” which conducted a “kind of ‘silent McCarthyism’” which “destroy[ed] the livelihoods of thousands of workers each year”. According to Liberty, the company gathered information on left-wing individuals via newspaper reports, petitions, election nomination forms, reports from other companies’ personnel officers, private detectives, the police, and even MI5 and the Special Branch. It would then provide this information on request to its subscribers — companies including construction firms, breweries, retailers, food manufacturers, insurance brokers, and car manufacturers. The Co-operative Insurance Society seems to have also occupied the upper-floor office space at the same time as the Economic League, and one wonders how well the staff of these two organisations would have got on with each other. Ketts’ successor on the ground floor of number 89 was, like Ketts itself, concerned with electrical goods and music. K J Leisuresound, however, was rather more of a specialist, focusing on hi-fi equipment and accessories such as tapes. To my memory it occupied all of the ground floor except for a small part on the left, looking from the front, which housed an office and the stairway to upstairs, more offices. So there were three large display windows and the main entrance. There were two demonstration studios, one for low/mid hi-fi systems and one for mid/high end systems. There was an AV room for TVs, video recorders etc, and there was a main showroom area for general display and selling accessories. The stockroom, a small service room and the “kitchen” were at the rear of the building. The emphasis was on hi-fi equipment and KJ had a very wide range of Japanese and UK brands, including some exotic “high end” brands. Accessories sales, in particular tapes, were an important part of the business, and Audio/Visual became increasingly important during the 1980s. KJ was the largest such store in Croydon and the surrounding area and was quite successful. A fire at the branch in the mid-1980s brought the musical era of 89 London Road to an end. Apparently caused by a lit display sign in one of the front windows, the fire damaged the premises severely; and as business had slowed down due to the recession, the company decided not to reopen here. However, it continued in business elsewhere, and is still in existence today at 26 New Cavendish Street, Fitzrovia, under the name of K J West One. Next to arrive at number 89 was a name still familiar today: Black & Decker. Founded as The Black & Decker Manufacturing Company in Baltimore, Maryland, in September 1909, the company began to design and manufacture its own power tools in 1916, and rapidly expanded throughout and beyond the United States. By the time it opened its London Road “Sales & Servicing” centre in the early 1980s, the company accounted for 20% of the worldwide trade in professional tools, and had embarked upon a grand reorganisation program to counter the growing competition from German and Japanese firms. The London Road branch opened in late June 1984, and was almost immediately broken into, with thieves forcing the fire doors and stealing around £2,000 worth of rotary mowers and garden rakes (around £5,800 in 2015 prices). It’s unclear how long the company remained on London Road. It seems to have been here until the mid-1990s, when it was replaced by a similar business called BMJ Power Tools, but it’s possible that the latter had some connection to Black & Decker itself. In any case, both were gone by mid-2001. Broad Green Sure Start, December 2011. Photo: author’s own. 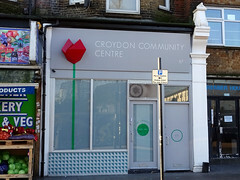 A substantial change of use came next, as the London Borough of Croydon took over the ground floor for use as a Sure Start children’s centre. The Council’s proposal, which was passed by the planning department in October 2001, included a large play area as well as an office area, meeting rooms, a lounge, a small coffee bar, and parking space for prams and pushchairs. Planning permission was granted on the condition that no more than 30 children should be present at any one time, in order to “protect the amenities of adjoining occupiers”. Announced in July 1998, Sure Start was an evidence-based government initiative intended to “prevent social exclusion and [...] improve the life chances of younger children through better access to early education and play, health services for children and parents, family support and advice on nurturing”. It was developed on the basis of several principles: involving parents as well as children; avoiding stigmatisation of “problem families”; targeting multiple factors rather than focusing on, for example, education or health alone; continuing for long enough “to make a real difference”; incorporating the opinions and involvement of parents and local communities; and remaining “culturally appropriate and sensitive to the needs of children and parents”. Croydon’s Sure Start programme focused on the Broad Green area, and formed part of Round 2 of the Sure Start roll-out. It lasted at 89 London Road until December 2011, but was then closed down. The ground floor of the building fell vacant, and remained so until early 2016. Poster advertising a dinner to raise funds for the purchase of 89 London Road, November 2013. Photo: author’s own. The upper floors of the building, however, continued in use. Croydon Islamic Community Trust (CICT) moved in during April 2009, and by late 2013 were providing services including daily prayer services, an Islamic education and homework group, martial arts lessons for children, a twice-weekly women’s coffee morning, conflict resolution services for young people, and marriage counselling. The Trust worked with other bodies including Croydon Council’s Family Resilience Service, leading the manager of this service to state in a letter of support that they had “found the organisation to be resourceful in delivering solutions to the community and [...to...] deliver with great integrity.” From February 2011, it was also responsible for leading Friday prayers for the Muslim staff and students at Croydon College. While CICT began its time on London Road as a tenant, it later launched an appeal for funds and finally bought the building in August 2014. This purchase was funded through donations from the members of the masjid, £265,000 of smaller loans (with a plan to pay these off within 3 years), and a single large loan of £550,000. The large loan came from a business owner who was given the ground floor shop premises as security for a period of 5 years. When announcing the completion of the purchase in August 2014, CICT Chairman Abdul Jalil expressed the hope that within 5 years, a way would be found to pay off the large loan and reclaim the ground floor for use by the community. Ground floor of 89 London Road, under refurbishment to open as a branch of Tariq Halal Meats, March 2016. Photo: author’s own. Thanks to: Brian Gittings; Dave Harwood; Leon Parker at the British Record Shop Archive; Pete at K J West One; the Planning Technical Support Team at Croydon Council; and the staff, volunteers, and patrons at the Museum of Croydon. Monetary conversions performed using the Bank of England inflation calculator (prices < £100 given to the nearest penny, prices from £100 to < £100,000 to the nearest pound, prices from £100,000 to < £1 million to the nearest £1,000, prices from £1 million to < £100 million to the nearest £100,000, prices ≥ £100 million to the nearest million). Some phone books consulted via Ancestry.co.uk. There were at least four different planning applications for the commercial building, but the one finally granted in September 1958 was for “Shops with offices over” (ref 58/1026, viewed on microfiche at Croydon Council offices). Earlier applications included one from 1957 that was denied as the suggested two-storey building was “not in keeping with the scale of the adjoining property” (almost certainly referring to the four-storey terrace at numbers 79–87) and “The size and situation of the site warrants the erection of a three storey building.” (ref 57/426). It’s not clear when the building received the name “Premier House”. This name is visible on the left-hand side of the frontage today, as shown in the first image here, and it’s used in lease particulars from 2006 for the first floor offices (PDF with creation date of 22 November 2006), but it doesn’t appear in any of the older planning applications I’ve looked at. While I was researching this article, Dave Harwood suggested that the building constructed in the late 1950s was later demolished and replaced by the modern one: “I remember buying a couple of vinyl LP’s from a carousel rack outside the shop between No. 87 and the Co-op building in the early 1970’s. It wasn’t a record shop as such but must have sold a variety of things. The building was set back from No. 87 like the newer building that is currently there [...]” (via email, 4 August 2015; see also the end of the section on Ketts in the main article). I initially agreed with him, mainly on the basis of a c. 1981 photo by Brian Gittings, which when viewed at maximum size appears to show a somewhat different building. 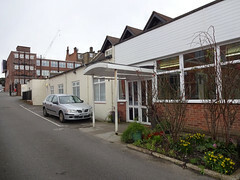 However, this photo is of a wide swathe of the road, and the building in question is shown at a very compressed perspective which is potentially misleading. A much clearer photo of the building in 1963, reproduced opposite page 19 in The Ketts Years 1946–1988 by C R Prickett, makes it clear that this was the same building that’s there today; pretty much the only differences are the windows and the ground-floow shopfront. I’ll discuss the church in more detail in my next article. The 1957 planning application mentioned above (ref 57/426) includes a drawing which shows four shops with an “open yard” behind. A planning application for frontage signs, granted in April 1959, shows a single shop frontage with three signs reading “Ketts”, two double entrance doors to the shop in the middle, and a door to the upper floors on the far left (ref A1872). Moreover, a later application was granted in July 1967 for “Conversion of single shop unit into 2 separate units”, with a drawing making it clear that the two new units would fill the entire ground floor. An advertisement for Ketts in the 2 October 1959 Croydon Advertiser gives the address of 89–91 London Road. Another, in the 26 February 1960 edition, lists white goods including a tumble drier, two washing machines, and a refrigerator, as well as a “suction cleaner”. (Both advertisements viewed as clippings in the firms files at the Museum of Croydon). Details of Ketts’ founding and quotation on the reasoning behind the name are taken from a book written by Charles Robert Prickett, the eldest of the Prickett sons: The Ketts Years 1946–1988 , pages 1–6. This book is the source of much of the information presented here, thanks to the copy he personally donated to the British Library in April 1995 (at the time of writing, the letter he wrote to accompany this donation is still enclosed within the book). He was “affectionately known as Bob and Mr. Robert”, and died “peacefully at home” on 23 October 2004, at the age of 89. The Ketts Years , pages 3, 7–8, and photos/captions opposite p9. Opening date of the Sutton branch is taken from a “Branch Location and Trading Period” table at the back of The Ketts Years . Two Sutton branches are listed in this table, with the earlier one being open from 1958 to 1968. However, a comparison with the photo of the 1970s branch shown opposite page 32 in The Ketts Years makes it clear that Brian’s photo is of that same branch. Locations of head office and other branches taken from a letter on headed notepaper accompanying the abovementioned April 1959 planning application (ref A1872). Number of branch openings in 1959–1961 taken from The Ketts Years , p26. The Ketts Years , p22. Examples of electrical goods taken from an advertisement in the 26 February 1960 Croydon Advertiser , viewed as a clipping in the firms files at the Museum of Croydon (see Acknowledgements below for price conversions). The Ketts Years describes the company’s initial attempts to sell the Thor machine in the late 1940s: it was “the first machine of its kind and one that was difficult to sell, since they were expensive and the public had no conception of the spin dryer principle.” These problems seem to have been overcome by 1960. Date of Whitgift Centre opening is taken from “Whitgift Shopping Centre Croydon: Thirty Years On”, published in April 2000 as a supplement to Shopping Centre magazine (viewed at the Museum of Croydon; Whitgift Centre box fS70 (658.8) WHI). This states on page 3 that “Although the first store — Boots the Chemist — opened its doors in October 1968, followed by Sainsburys, Woolworths, Marks & Spencer and a couple of banks, it was not until exactly two years and a few more tenants later, October 1970, that the official ceremony for the 350,000 sq ft development was performed by the Duchess of Kent.” According to a “Branch Location and Trading Period” table at the back of The Ketts Years , Ketts’ Whitgift Centre branch opened in 1968, so must have been in the first wave of Whitgift Centre openings. According to an advertisement on page 15 of the 24 April 1970 Croydon Advertiser , this branch was in unit 1038, which today is occupied by a shoe shop called Zucchi. Regarding the London Road premises, Pricketts Ltd was granted permission for “Conversion of single shop unit into 2 separate units and additional toilet accommodation” on 28 July 1967 (ref 67/2179/20/1317) and for “2 Illuminated Fascia signs” on just the right-hand half of the ground floor on 4 September 1967 (ref A4691). Croydon council planning records state that the conversion into two units was completed by 22 April 1969. Croydon phone books list Croydon Heating Co at number 89 from August 1969 to August 1971 inclusive and Discount Heating Supplies (Kent) Ltd at 89a from March 1973 to July 1977 inclusive (with the exception of January 1976 for some reason). The 1970 1:1250 Ordnance Survey map correspondingly shows number 89a on the left side and number 89 on the right. Crohnoid, via email, 25 August 2015. Via email, 4 August 2015 and 6 August 2015. A “Branch Location and Trading Period” table at the back of The Ketts Years states that the London Road branch opened in 1959 and closed in 1978, that a rather short-lived High Street branch opened in 1964 and closed in 1965, and that the Whitgift Centre branch opened in 1968 and closed in 1988. An advertisement for Ketts on page 15 of the 24 April 1970 Croydon Advertiser gives two addresses: 89 London Road and 1038 Whitgift Centre. Ketts is listed at 89 London Road in Croydon phone books up to and including January 1979. A letter sent from the Economic League to Croydon Council, dated 10 April 1979, expresses concerns about “the company moving into Ketts’ old premises on the ground floor of this address” (included in records of planning application ref A78/226); this also implies that Ketts had gone by then. The October 1980 Bromley/Orpington phone book lists Ketts only in the Whitgift Centre. The company itself was sold to Rumbelows, a division of Thorn EMI, in November 1988 ( The Ketts Years , pages 43–47). The Economic League is listed at 89b London Road in phone books from the 1964 Kent/Surrey edition to the Bromley/Orpington October 1980 edition inclusive (albeit at 89 rather than 89b in 1964 and 1965). The February 1981 Croydon edition instead lists it at 850 Brighton Road, Purley. Confirmation that 89b was in fact on an upper floor of 89, rather than in a separate building, comes from the April 1979 letter referenced in an earlier footnote. Economic League Annual Review 1986 , quoted on page vi of The Economic League: The Silent McCarthyism by Mark Hollingsworth and Charles Tremayne. The Economic League: The Silent McCarthyism , page 1. The Economic League: The Silent McCarthyism , Chapter 3. According to Appendix IV of this publication, the Economic League’s Central Records and Research Department was just up the road at 99a Thornton Heath High Street. The London Road premises appears to have been a sort of branch office; the April 1979 letter referenced above states that one of the activities carried out there was “telephoning”. The list of “Companies subscribing to the Economic League” on pages 91–99 of The Economic League: The Silent McCarthyism includes Balfour Beatty Construction Ltd, Bass Charrington plc, BHS plc, Brooke Bond (part of Unilever), Dalepak Foods, Ford Motor Co Ltd, Heinz Ltd, John Laing Construction Ltd, Legal and General Group plc, Nissan (UK) Ltd, Scottish and Newcastle Breweries, and Taylor Woodrow plc. Croydon phone books list the Co-operative Insurance Society at 89 London Road from at least June 1966 to at least March 1973. Evidence that this was on an upper floor of the Ketts building comes from a photo of the building in 1963, reproduced opposite page 19 in The Ketts Years ; this shows the words “Insurance Society Limited” in a second-floor window, with what is almost certainly the word “Co-operative” in a curve above these. Information provided by Pete at K J West One (via email, 17 March 2016). As corroborating evidence, K J Leisuresound is listed at 89 London Road in Brian Gittings’ 1980 survey of central Croydon retail and in phone books from the Bromley/Orpington October 1980 edition to the April 1984 Croydon edition inclusive. Regarding the fire, the March 1984 Goad plan shows number 89 as “vacant”, and a planning application granted to Black & Decker in July 1984 includes a council officer’s report describing the premises as “a large vacant shopfront [...] These premises were damaged by fire and have been boarded up for some time” (ref 84/1310/P). Pete recalled the fire as having happened in 1985, but emphasised to me that all the dates he gave me were approximate and from memory. Background information on Black & Decker taken from the International Directory of Company Histories , volume 20, pages 64–66. The company was granted planning permission for a new shopfront for “Sales & Servicing” of “Black & Decker small tools and assessories [sic]” in July 1984 (ref 84/1310/P). Opening date and details of robbery taken from an article in the 6 July 1984 Croydon Advertiser , viewed as a clipping in the “London Road West Croydon” roads file at the Museum of Croydon (see Acknowledgements below for monetary conversion). The article states that “the Black and Decker shop in London Road, West Croydon” was broken into “a day after the business opened”, and that this took place “on Saturday night”. The Saturday preceding 6 July 1984 was 30 June, and so the opening must have taken place on 29 or 30 June, depending on what the reporter meant by “a day after”. It’s perhaps also worth noting that the company wasn’t actually granted planning permission for its new shopfront until a few days later, on 3 July 1984 (ref 84/1310/P). Black & Decker is listed at 89 London Road in Croydon phone books from 1985 to July 1999 inclusive and Goad plans from March 1985 to May 1996 inclusive. BMJ Power Tools is shown on Goad plans from May 1997 to May 2000 inclusive, and listed in both editions of Shop ‘Til You Drop (probably published around 1998 and 2002 respectively). The overlap in years here is suggestive, but I’ve found no clear evidence of a connection between Black & Decker and BMJ Power Tools, so this may just be a mistake in the phone books. The June 2001 Goad plan lists the property as vacant, as does a mid-2001 planning application (ref 01/2134/PR; this latter also states that the owner of the building is BMJ Power Ltd). Details taken from planning application ref 01/2134/PR, granted to the London Borough of Croydon on 24 October 2001 and including a floor plan dated 10 August 2001 as well as a front elevation showing “Sure Start” signage. Goad plans list the property as vacant in May 2002, and as “Sure Start Educational Establishment” from May 2004 to May 2011 inclusive (it should be noted that I haven’t looked at Goad plans later than 2011, and haven’t seen one from 2003). Information taken from N Glass (1999), “Sure Start: The Development of an Early Intervention Programme for Young Children in the United Kingdom”, Children & Society 13(4), 257–264. Initial funding totalling £452m was allocated for Sure Start in England, and the programmes were made available to all children living in Sure Start localities, not just “problem families” (though these localities would be chosen “to ensure that those in greatest need benefit most”). The author’s biography on this article credits them as the Deputy Director of the HM Treasury Public Services Directorate, and as having “led the inter-departmental review which culminated in the Sure Start proposals”. Sure Start , Department for Education and Skills, May 2002 (British Library shelfmark: Document Supply m02/27327). 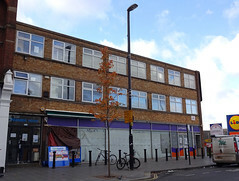 According to a letter from an anonymous “early years worker” in the 11 April 2012 Croydon Guardian (p19), “London Road Sure Start was closed last December” (i.e. in December 2011). Continued vacancy after that is from personal observation. According to a Design & Access Statement (PDF) submitted as part of a planning application (ref 13/04234/P) in December 2013, CICT were “initially occupying the space in April 2009”. List of services, quotation from Council officer, and information about Friday prayers at Croydon College also taken from this document (which includes images of letters sent by said officer and College in support of the application). Information taken from a video of an announcement by Abdul Jalil Shaikh on 8 August 2014.